Eric Lemelson found his "calling" as a Pinot noir producer after a series of serendipitous events that began with his decision to move to Oregon from the East in 1979 to attend Portland's Reed College. Oldest son of noted independent inventor Jerome Lemelson (1923-1997), Eric has always followed in the creative and entrepreneurial spirit of his family. Even before graduating from Reed in 1981, Eric realized that Oregon was his true home. His career path following graduation began with politics: an internship for an Oregon Congressman led to positions on several state and national political campaigns and in the State Legislature. Later he played guitar in a rock and roll band, then attended law school at Lewis and Clark, where he studied environmental law. He received his J.D. in 1992 and ran a research center on water law for several years after graduation. While in law school, Eric bought a farm in the hills on the eastern edge of Oregon wine country, following a longtime dream of living in the country. A longtime fan of Oregon wine, Eric began to notice the exceptional quality of Oregon Pinot Noir produced in the 1990s. Intrigued, he contacted several producers to learn about viticulture. He discovered that his farm's southeast slopes and volcanic soils were well-suited for wine grapes. In 1995, he planted two acres of Pinot Noir and Pinot Gris, later named Chestnut Hill (now 15 acres and growing), and founded Lemelson Vineyards. Today, Lemelson owns 120 acres of vineyards and has built a state-of-the-art winery. Assisting in the winemaking is Anthony King. There are three vineyard-designate Pinot Noirs: Stermer Vineyard (site of winery), Chestnut Hill Vineyard, and Meyer Vineyard. Two Reserve Pinot Noirs include Thea's Selection and Jerome's Reserve. The wines are largely sold direct through the website. 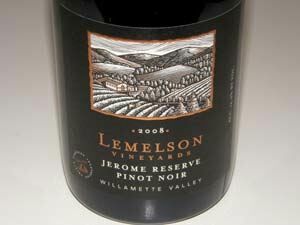 In mid 2009, Lemelson opened its doors to tasting and tours Thursday to Monday, 11:00 AM to 4:00 PM. The winery is located at 12020 N.E. Stag Hollow Road just outside the town of Carlton. The tasting room overlooks a breathtaking vista of the Yamhill Valley.